Welcome, to one of my favorite days of the week, Tablescape Thursday. I love my dishes, and I love to mix and match them to create new looks. Today’s tablescape is simple, but elegant. I chose some of my china and crystal and mixed it with a set of my great grandmother’s Limoges China. My great grandmother was married in November of 1915. The Limoges China was her wedding pattern and was used throughout her life. She had nine children, and it always graced the table of large family dinners. My mother remembers her grandmother using this china for holiday dinners even as the family grew to include children’s spouses and grandchildren. It has been well loved and well worn which makes it all the more special. The underpinning I chose was a ivory lace tablecloth along with ivory damask placemats and napkins. The china is anchored on gold chargers. I chose Mikasa English Countryside as the bottom plate of the plate stack. I placed my Great Grandmother’s Limoges China atop. Mikasa Golden Tiara crystal and Onieda Michelangelo flatware finish off the place setting. Below is a close up of my Great Grandmother’s Limoges China. I love the cream soup bowls. I chose a simple centerpiece of an orchid flanked by crystal candlesticks with ivory candles. Thank you so much for stopping by for Tablescape Thursday. I will be back next week to reveal the bonus room makeover. I hope that you have a blessed and wonderful weekend!!! Thank you so much for Tablescape Tuesdays. I have many types of china and so much enjoy using them. I just discovered your blog and I am in love!!! Hi Maxine, you have made my morning! I’m so glad that you found my blog and that you like it. I’m also so happy that you love tablescaping as much as I do. It sounds like we both share a love of dishes. Thanks so much for your sweet comments, and I hope that you have a wonderful day!!! Yes, the table is so very elegant!! !…and yes, I love the cream soup bowls too!!! Thank you Shirley! Several of the dishes were well worn, but I was so fortunate to have 8 of the cream soup bowls that were still in very good condition. I hope that you have a wonderful weekend!!! Thank you Rhonda! The crystal was from my bridal registry 22 years ago. I’m so glad that you stopped by, and I hope that you have a wonderful weekend!!! This is surely an elagant table and made SO special in that it features your great Grandmother’s china!!! That is wonderful that you have it. Thanks for sharing such a pretty table. Have a beautiful weekend. I LOVE the double handled bowls too, they were the first thing I noticed. Hi Pinky! Thanks you so much for your sweet comments. I’m glad that you loved the cream soup bowls too. They are my favorite! I hope that you have a wonderful weekend!!! Hi Maryjo! Thank you so much for your very sweet comments. I’m a very sentimental person too! I’m so glad that you stopped by, and I hope that you have a wonderful weekend! I love a beautiful tablescape and this one certainly is! I am so glad you found your way to Celebrate and Decorate. I am subscribing now to Belle Bleu Interiors now! I am hosting a tablescape blog hop next week and I wish I had known of your blog before, but I will make sure I contact you before the next one! Do stop by and check out all the alfresco tablescapes next week! Oh, I also have a group tabletop Pinterest board. If you follow it and then send me a message, I will add you to it! Hugs, new friend! Chloe, thank you so much for your very sweet and gracious comments. I’m new to the blogging world and have enjoyed reading your blog. I’m so happy that you subscribed to Belle Bleu Interiors! I’m very flattered! I can’t wait to check out the alfresco tablescapes next week. I love dishes, and I love tablescapes! I’m so glad that you stopped by. It is so great to meet a new friend. I hope that you have a wonderful and blessed weekend!!! This is also my first time visiting your lovely blog and I am happy to see that you are a girl after my own heart. 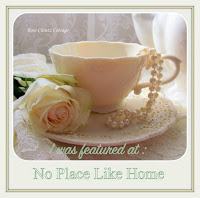 Your gorgeous table brought me to your blog since I too love to create pretty tablescapes. Your grandmother’s Limoge china is stunning. Such an elegant and timeless pattern and you have styled it beautifully. Please stop over for a peek. It is so nice to meet you Janet. Thank you for your very sweet comments. I’m so happy that you stopped by, and I will stop over to check out your blog. Beautiful! I love the touches of gold! Thank you so much Jennelise! I hope that you have a wonderful day!!! Stacey, thank you for your kind comments!!! How lucky you are to have your great-grandmother’s china. You’re right. It is truly elegant! Thank you so much Pam! I know that I’m very fortunate to have her china. I love dished so much, and I especially treasure the ones that belonged to my loved ones. I’m so happy that you stopped by, and I hope that you have a wonderful weekend!!! I like how you mixed the formal Limoges china with the informal Mikasa English Countryside…it makes for a very pretty table. Hi Karen! Thank you so much for your very sweet comments. I’m so happy that you stopped by, and I hope that you have a wonderful weekend!! !